Twenty-five years ago, while we were sleeping, 16 persons were dragged off under the Internal Security Act (ISA) and later were presented to the public as Marxists with clandestine communist connections. On 2nd June 2012, MARUAH and Function 8 commemorated the 25th anniversary of ISA arrests under the alleged “Marxist Conspiracy”. 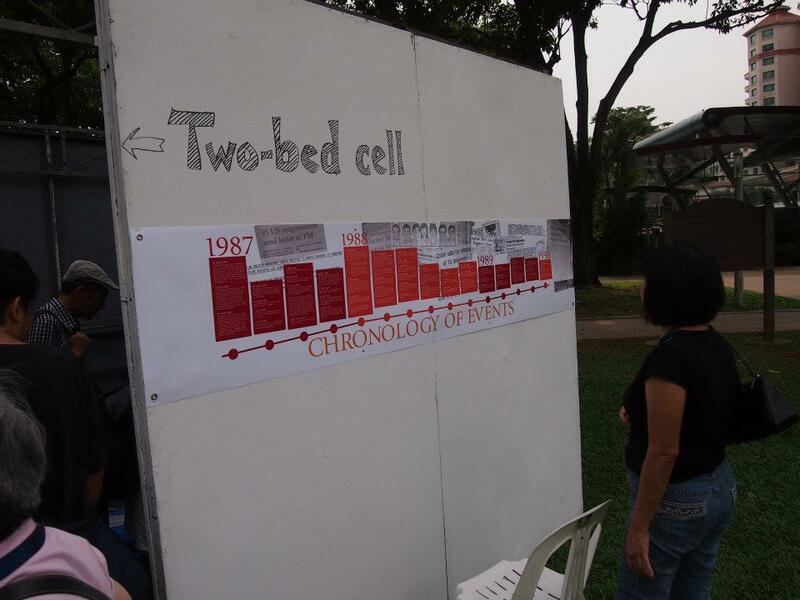 An exhibition area included mock-ups of detention cells, original items created during detention, and posters detailing the profiles of the ex-detainees. Please click this link to view MARUAH’s petition to call for a Commission of Inquiry on the alleged Marxist Conspiracy. If you believe in it too, please provide your details and sign on to the petition! Please also share the link on Facebook, email it to your friends or even tweet about it! We need 350, 000 signatures and it’s not going to be possible without your help! We need to call for a review of a dark episode in Singapore’s history. It has been 25 years since Operation Spectrum, when 22 persons were detained for allegedly being “Marxist Conspirators”. Even then, there were doubts about the accusations and whether these citizens should be detained without trial. 25 years later, these doubts continue to linger. Let’s call for an independent Commission of Inquiry now! Sign MARUAH’s petition to call for a Commission of Inquiry on the alleged Marxist Conspiracy at this link. We have been informed by the police on the evening of Tuesday, 15 May that the exemption granted under the Public Entertainments and Meetings Act to Speakers’ Corner, Hong Lim Park has been revoked with effect from 16 May to 26 May 2012 because of the upcoming by-election. A police permit is therefore required for our event on 19 May 2012. Owing to the short notice and uncertainties in obtaining a police permit, as well as the prospect of inconvenience to our guests and contractors should the permit be refused, we are sorry that our event at Speakers’ Corner, Hong Lim Park, has to be postponed. We deeply regret that a by-election in the single-member constituency of Hougang, has disrupted and inconvenienced Singaporeans from enjoying activities at Hong Lim Park which is not part of Hougang. We will now hold our event on SATURDAY, 2 JUNE 2012 at 3.00 pm. The programme remains unchanged and, we hope to continue receiving your support. We are aware that this notice may not be read by all our guests and members of the public who have made plans to be at Hong Lim Park on 19 May 2012. As organisers, we will be at Hong Lim Park to meet those who may turn up because of our inability to reach them. To mark the 25th anniversary of Operation Spectrum in which 15 (later 16) Singaporeans were detained under the Internal Security Act, the Singapore People’s Party with ‘Achtung! 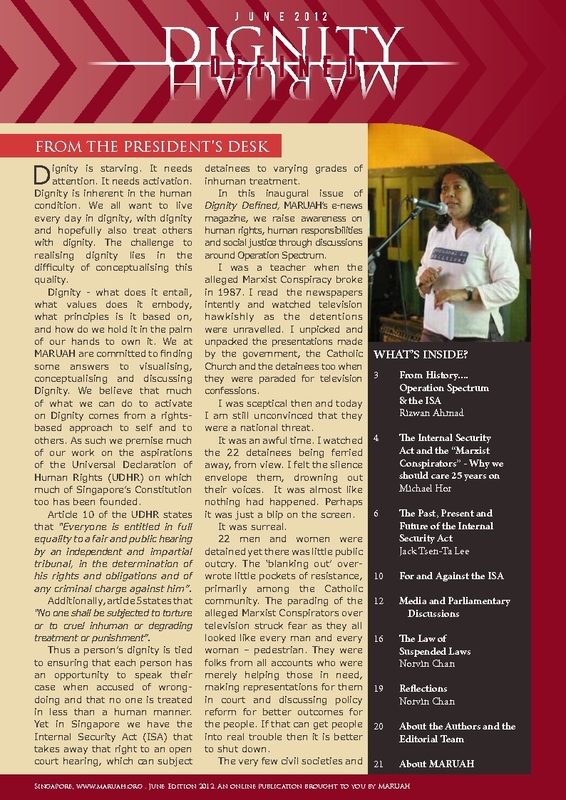 Productions’ – a student initiative – will present a staged re-enactment of the parliamentary session in which Mr Chiam See Tong, the sole opposition MP at that time, tabled a motion calling for the release of the alleged Marxist conspirators who were detained without trial. You are currently browsing the archives for the ISA category.